This bike won't win you the Tour de France, but it will get you around town and even out into the country on occasion. This was a yard sale "find" that I cleaned up (it was coated in oily goo), replacing the wheels (Wolber rims with older Shimano 105 hubs), tires (Michelin Sport) and chain to transform it into an eminently serviceable and smooth ride. It's approximately a 60cm lugged Reynolds 531 frame, which should work for people 5'8" to 6'2" or so. (I'm 5'10" with a 32" inseam.) I believe it's a UO-8, about 15 years old, with neat Simplex and SunTour components. It's slightly less than mint condition, but it ain't junk either. 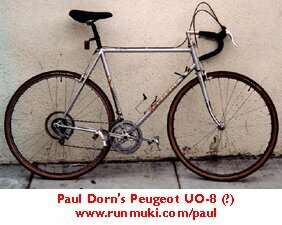 Vintage Peugeots such as this, have long had a certain appeal to select velo fanatics, who have been known to write paeans (pains?) and listserve rants on these idiosyncratic French machines. If you like French films, cuisine, and culture, you can't NOT have a French bike. This bike resides in the "greater" San Francisco Bay Area (i.e. in Davis, but I can easily transport to San Francisco.) I'd prefer to avoid shipping. Sorry, this bike has been sold, as of 9/5/02.